In the lead-up to President Barack Obama’s State of the Union address, activists across the country took to Twitter, reaching 2.11 million followers using the #TalkPoverty hashtag, to encourage the president to address the issue of poverty and propose bold solutions. The president didn’t disappoint. Tuesday night, President Obama laid out an audacious vision for moving our country and our economy forward in a way that will promote shared prosperity and bring millions of struggling families into the American middle class. The president started off by reminding Congress how much is at stake for families and the economy in the upcoming fiscal showdown, and insisted on a balanced approach to deficit reduction—an approach that protects struggling families, raises adequate revenue, and leaves sufficient room for investments to create jobs and grow the economy. These will be critical principles to inform the policy battles ahead where so many programs serving the most vulnerable are at risk for arbitrary cuts, even as conservatives seek to protect wasteful tax loopholes and bloated defense programs. Creating good jobs. The president laid out several public investments and reforms that would create millions of jobs. Unemployment is one of the primary drivers of poverty and the president set forth a menu of solutions such as investing in infrastructure and school repair, clean energy, and manufacturing that will bring millions off the economic sidelines, grow our economy from the middle out, and enable workers to earn good wages to lift their families above the poverty line. Included in this agenda should be the president’s “Pathways Back to Work” proposal, part of President Obama’s American Jobs Act, which would create hundreds of thousands of subsidized and transitional jobs for low-income and long-term unemployed workers. Raising wages. A good job is the lynchpin of any national strategy to cut poverty in half. But as the president rightly noted, under current law, a full-time worker with two children earning the minimum wage will still raise his or her family in poverty. In fact, we haven’t raised the federal minimum wage since 2007, and this basic wage floor has lost 30 percent of its buying power since the 1960s due to a failure to index the minimum wage to inflation. The president’s proposal to raise the federal minimum wage to $9 an hour and index it to the cost of living would increase the wages of millions of low-wage workers, and create demand in the economy for goods and services as workers spend their increased wages in local businesses. Training the next generation of workers. The president also recognized that we don’t just need to create new jobs, but we need to also train workers to fill them. His proposals to better prepare high school graduates to compete in a high-tech economy, equip students with the information they need to make smart choices about a college education, and secure investments in worker training, will help ensure that American workers are prepared to fill the jobs of tomorrow. Investing in children. Child poverty costs the U.S. economy $500 billion a year. Conversely, investing in early education for young children is one of the most important strategies to cut poverty, leading to outcomes such as better high school graduation rates, higher worker productivity, and lower rates of violent crime that yield $7 in savings for every $1 invested upfront in early education. The president’s plan to provide universal pre-K would provide millions of parents with a quality, reliable place for their children to thrive, enabling them to work more or steadier hours to bring additional income into the family, as well as create greater economic opportunity for their children in the long term. Strengthening families. The president also recognized the key roles that families play in cutting poverty, offering solutions that promote more stable and healthy families. The president called for passage of the Violence Against Women Act, ensuring that more women are able to benefit from services and reforms to flee abusive relationships, for example. He also proposed an end to financial penalties for marriage in our public policies and for a greater emphasis on policies that encourage fathers to take responsibility for their children. 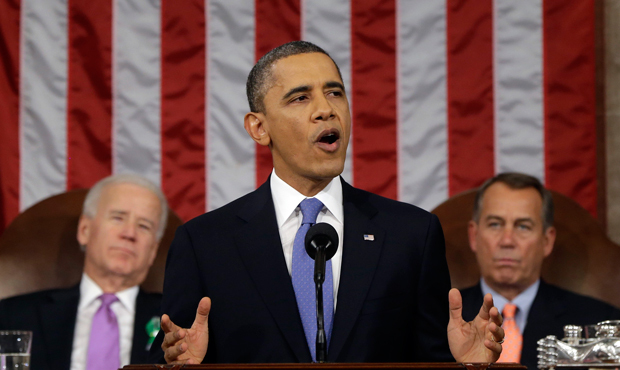 President Obama’s State of the Union address enshrined important principles to ensure that the coming deficit reduction fights do not exacerbate poverty and inequality. But he also set forth a bold and proactive agenda that, if enacted, would make major strides in cutting poverty. Now is the time for the #TalkPoverty activists, who urged the president to speak out about poverty, to translate these inspiring words into policies that would bring millions of American families into the middle class.